In times of fear or distress, the body reacts by releasing increased amounts of adrenaline to activate the fight-or-flight response. Since this defensive response remains activated throughout the day in most anxiety sufferers, the result is an overflooding of adrenaline in the bloodstream, which then manifests as spontaneous episodes of heart rate acceleration. Also, the same brains section that controls the fight-or-flight response also regulates functions like blood pressure and heart rate, which may explain why panic attacks often result in, or are mistaken for, tachycardia. The rapid and shallow breathing induced by a panic attack can majorly constrict the blood vessels, which forces the heart to pump faster, resulting in tachycardia. Moreover, some anxiety sufferers tend to hyperventilate even during non-anxious periods (hyperventilation syndrome), resulting in intermittent tachycardic episodes. 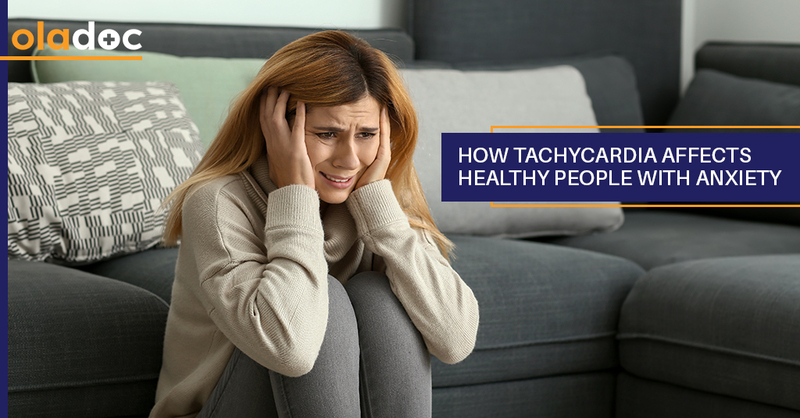 While anxiety attacks commonly trigger tachycardia, there are times when tachycardia itself can induce a panic attack. Along with raising anxiety levels upon being diagnosed with a heart condition, adopting detrimental habits like smoking and overeating as coping strategies for an anxiety diagnosis contributes towards a heart problem, which then results in more anxiety. Most anxiety sufferers automatically gravitate towards negative thoughts and expecting the worst outcome, usually a heart attack, during a panic attack. The belief is further cemented with hyperventilation, which often mimics heart attacks through symptoms like chest pain and leg weakness. However, despite its notorious reputation, a panic attack rarely ever leads to a heart attack, especially when one has no history of heart problems. All it does is intensify the anxiety when paired with catastrophic thoughts. Symptom Patterns: It is an anxiety attack if a fast heart rate is followed by stressful emotions, and a tachycardic episode if emotional stress comes after an escalated heart rate, lightheadedness, and/or chest pain. Fainting or Seizure: It is anxiety if warning signs like discomfort and unsettling feelings are experienced prior to passing out, while fainting during sitting, standing exercising, or other physical activity may indicate tachycardia. Hyperventilation: Hyperventilation followed by numbness in tingling around the mouth and in the fingertips of both hands signals an anxiety attack, while lightheadedness or fainting along with hyperventilation indicate tachycardia. Triggers: A gradual, steady increase in heart rate indicates an anxiety attack, while obvious skipped or ‘extra’ heart beats are usually signs of tachycardia. A Heart Monitor: If symptoms are difficult to differentiate, then having your heart rhythm recorded constantly for 2-4 weeks can help determine the differences between the two conditions and improve diagnosis. Although relatively harmless on its own, tachycardia can result in a stroke or heart attack if left unchecked in case of an already present heart condition. This is why people diagnosed with a heart condition should get a proper examination following a tachycardic episode, even if the symptoms are not obvious. You can also book an appointment with a top Cardiologist in Lahore, Karachi and Islamabad through oladoc.com, or call our helpline at 042-3890-0939 for assistance to find the RIGHT Doctor for your cardiac concerns.